Rewind the clock back 70 years. Tallassee was known in the sports world for its high school football team and its highly acclaimed unbeaten streak. Coach John Edward O'Brien's Tigers put together six straight years of winning football without a blemish. 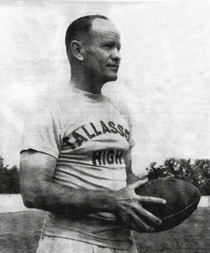 O'Brien, for whom the football stadium stadium is named today, began his coaching tenure at Tallassee in 1936. W. C. Bryant wrote the biography on O'Brien titled, "Hot and His Boys," and recounted the story of his nickname. "The story goes that Ben Englebert, BSC basketball coach, called O'Brien from the bench and said, 'Get in there, O'Brien and get hot.' The crowd supposedly heard Englebert’s admonition and took up the chant, Get Hot, O’Brien, get Hot! "That’s when the little forward began to hit from all the angles. The press picked up the nickname, "Hot," and a legend was born." O'Brien coached at his alma mater Tallapoosa County High School (Dadeville) in the early 1930s prior to taking the Tallassee job. At THS, O'Brien compiled a 120-29-7 record in 17 seasons, but he is most known for the Tigers 57-game unbeaten streak. The run began with a 20-0 victory at Eufaula on Oct. 10, 1941 and ended with a 21-7 loss to Sidney Lanier on Nov. 14, 1947. There was a 0-0 tie with Wetumpka on Sept. 29, 1944. As noted in Bryant's book, an estimated 19,000 turned out to Cramton Bowl to watch Tallassee and Lanier play. Emory Folmer was an 18-year-old senior captain on the Lanier squad. "We knew every back, who the passer was, who the receivers were and who we had to stop," stated Folmer in the Bryant book. Folmer went on to become mayor of Montgomery. Lanier had beaten Woodlawn the previous week at Birmingham's Legion Field and led 13-7 at halftime against Tallassee. They scored a safety and touchdown in the second half for the 21-7 win. "Tiger fans in the huge concrete stands - some shaking their heads, some weeping quietly – filed out. The thousands of Tiger followers, who, over the years, wondered when, where and how the winning streak would end, now knew, in vivid detail. It was over." In the midst of the streak in 1947, Birmingham News-Age-Herald writer Jerry Bryan wrote about Tallassee's achievement to "break all marks." He did call the team the "Indians." There was a Tallassee baseball team called the Indians in the 1940s, but the THS football team was and is still known as the Tigers. "(It) eclipsed all previous records for consecutive football streaks," Bryan wrote. "The best records available show a streak of 51 wins in 52 games, with one tie, amassed by Massillon (Ohio) High under the guidance of Paul Brown, later coach at Ohio State and new mentor of the Cleveland Browns." Bryant pointed out in his book that the streak was regarded as a national record. "(It) stood for almost 20 years. From 1959 through 1966, Jefferson City High School in Missouri strung 71 games without a defeat or a tie. From 1992 through 2003, Concord De LaSalle High in California neither lost nor were tied for 151 football games, a national record that still stands." The Alabama High School Athletic Association lists the state's longest unbeaten streak at 65 games (62-0-3) by Tuscaloosa High School from 1925-31. According the the Alabama High School Football Historical Society, Paul Burnum's Black Bears began the streak with a 98-0 win over Francis Marion in the first game of '25 and ended it with a 6-0 loss to Holt in the season opener of '32. Andalusia went 58 games (57-0-1) without a loss from 1972-78. Tallasssee's run from 1941-47 (56-0-1) is listed as third best in the state. The longest streak without a tie is 55 games, set by Clay County from 1994-97 under coach Danny Horn. 1947 Tigers (Photo courtesy of Bill Patterson, from the book "Hot and His Boys"
In Bryan's story from 1947 he added that Tallassee "played in their own baliwick pretty closely over the years. During one streak of late 1942 and 1943 (they) went 12 games without being scored on." During the '43 season, Tallassee shutout nine of ten opponents outscoring its foes 253-19. In the '47 season, Tallassee concluded the year with a 20-14 win at Phenix City in the game that followed the Lanier loss ending the streak. The Tigers were 9-1. Bryant quoted O'Brien on the finality of the streak. "Now that's it's over, as a team, as coaches, as students, as fans, let's realize that it takes a lot of luck and lots of good boys to go 57 games without a defeat and take it on the chin. Somehow I fell a little relaxed. Don’t you?" In 1948, Tallassee was 6-2-2. In '49, the Tigers went 4-4-1. O'Brien had his only losing season at THS in 1950 going 4-6. He retired from coaching two years later becoming the principal at the high school for three years. He was an avid golfer during his golden years. He died on Jan. 18, 1977.